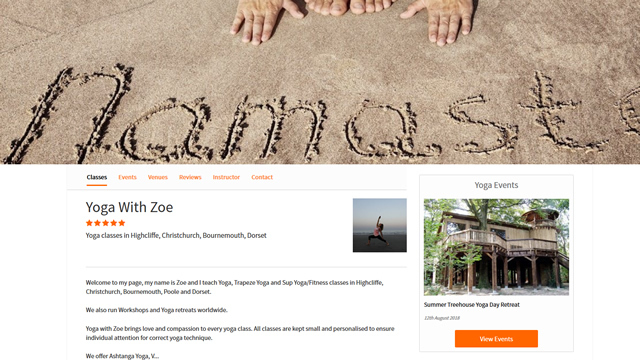 on the UK' s No1 Yoga Class finder and booking platform. Yoga Class Near You is the best way to market your business and bookings. "I was recommended by two other local instructors actively using the Near You platform. They said it was fantastic and I had to try it out myself! So, I signed up! It was quick and easy to set up and the team were very helpful and always at the end of the phone to help. It was great being able to speak with someone, nothing was too much trouble. My friends were right it really does make my life so much easier. Taking online bookings is a life saver. My existing customers find it really easy to use and the Feefo reviews are getting me more new students. So, it's a perfect way to grow. Now 95% of my business is booked via NearYou. I wish I had done this before and if you are looking to do online bookings I would recommend Near You! I'd like to thank my friends for putting me onto it." "I think it's better than anything else out there. The new website looks slick and the book online facility works well." "Since I started using NearYouPay my business has grown and grown. It's just getting bigger and bigger. Now I only take online bookings and it works. My customers now know they have to book in advance to reserve a place. I don't have to handle cash or cheques so I can start my classes without having to worry about collecting payments. No more no shows my classes are all full. People know that they have to book to get a place." "Excellent value for money and easy to book online. Fun, challenging and I can’t wait to go again!" "Loads of choices! Very easy to find, book and review the classes. I find it important to know instructors are good and the reviews help with finding quality classes!" "I can feel myself improving with each class. Great service, easy to use app." "Very easy to use find a local plates class and to book online." "Good choice of instructors and lots of deals. Simple, easy and fast to book. Will use again!" The unbeatable way to promote your yoga business online. It's the best way to market your business online and get noticed.